My name is Casper Mork-Ulnes. I was born in Norway but I’ve lived most of my life abroad: Italy, Scotland and over twenty years in America. I’ve lived in New York a little bit but mostly in San Francisco. A year ago I moved to Norway with my family to try living there for a little bit and to start an office in Oslo because I think that there is a lot of opportunities for young architects in Scandinavia and particularly in Norway. I got my degree from the California College of the Arts (CCA) in 1997. After I went to CCA, I worked for ten years for a local company called Pfau Long and then I attended Columbia University in New York for my master’s degree. When I was finished there, Peter Pfau offered me to come back and work with him. I agreed, came back and worked for him until 2005. In 2005, I started my own firm “Mork-Ulnes Design”, which is my last name. Greg (Grygoriy Ladigni) started working with me in 2006/2007. We’ve built a project in Venezuela, and then here in the USA in Virginia, Wyoming, California and Maine. In 2011, I moved to Norway to start up an office. The name of the firm changed to “SFOSL”: the airport code names for both cities San Francisco and Oslo. We have offices in both places, the reason being that we have strong inspirations from both cultures: the openness to invention here in California and the Norwegian straightforward, pragmatic, functional side. In Oslo, there are four of us, and in San Francisco, Greg is the only full-time person and sometimes we have some freelance help but we draw from both offices. Sometimes Greg works on stuff in Oslo. So we draw resources from each other. I come back to San Francisco every six weeks to meet with clients and give Greg some support. I speak with Greg everyday and we have two long Skype conferences twice a week because we have a lot of work ongoing. E-mail works but there’s nothing like a phone conversation. I’ve always wanted to design or build a church. 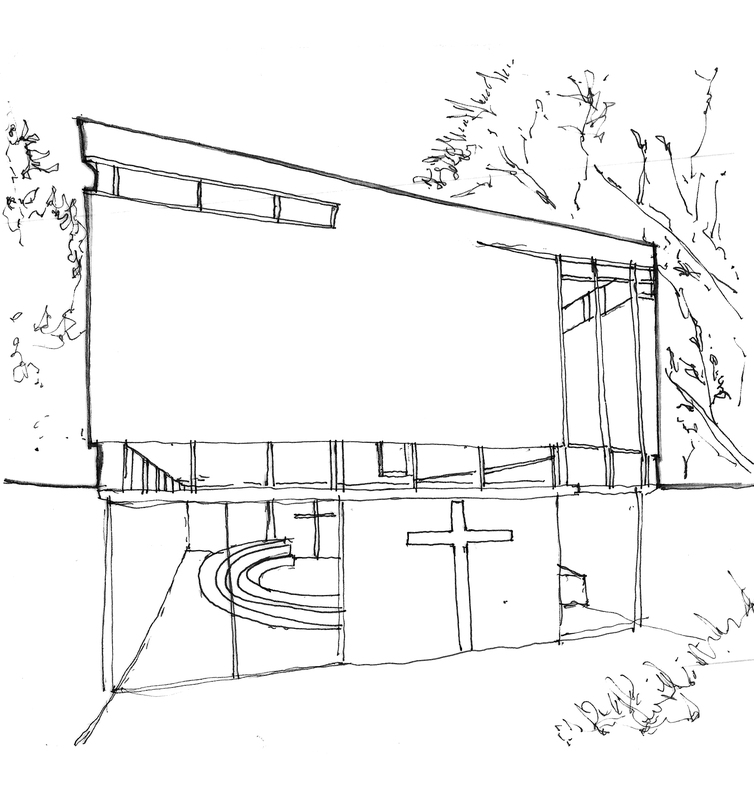 I designed a church with PFAU right before I went out on my own but unfortunately it was never built. I worked on it for two years and one day I would love to see it built. It was for Dominican University in San Rafael. It was an RFP (request for proposal). There was a lot of big name architects and we were one of the only local firm’s so we were fortunate enough to get the project. It was amazing to work with the Sisters and one of the Father’s there. It was one of the most giving experiences I ever had. It wasn’t built because of economic reasons, because of the economy at the time. Maybe the smallest building that I’ve ever designed: the first cabana. It was very small, only a hundred square feet (or 9,3 square meters) and it was a prototype for what became the modern cabana. It’s the first one that I think of because in so many ways about waste of material, economics and space: making something good that is only ten square meters. It was also my first project on my own, in 2005. I guess something that would cause a war for some reason, some sort of military or weapons plant, something like that. I guess it’s from a consciousness perspective. I’m afraid in many ways it’s San Francisco even though I don’t live here full time. It has almost everything: in the same day you can surf and ski, it has a wine country. It is very nice compact city but at the same time there are seven million people around you but you have this very dense urban core. Even though my favourite city to visit is New York. Definitely drawing. I don’t like to talk very much. I like to talk inside the office, but not publicly. Strangely enough, in America, I think the first time I felt 100% like I was an architect was when I became a licensed architect. I guess it wouldn’t be the same in Europe, but here it’s like a big rite of passage, it’s a legal thing. You can’t call yourself an architect in the USA until you’re a licensed architect, even though you have a graduate degree in architecture and have worked for twenty years. Maybe the question of sustainability. When they ask you what is sustainable in your architecture and you just talk about technologies like this, the recycled material, or no toxic paint, but I think it’s a much larger question than just fluffing it up by adding solar panels on the roof and using recycled material. That’s just fluff and I don’t think that’s really sustainability. That’s why we don’t market it on our website: I think the question is bigger than that. The same thing, the question of sustainability, what’s being done, where it’s going and how it’s being resolved. What is the most ridiculous building in San Francisco? There’s quite a few, but I think the jukebox stands out. “Fortunate son”, by Circle Jerks. The original is just as good. It’s by Creedence Clearwater Revival. Try to get something built as quickly as you can. Don’t obsess about the paper architecture. Try to actually get a project built because I think you learn more when you’re trying to build a project than anything else. Dealing with the economics of it, the client, the contractor, constructability, and the permits, all of those things. Architecture is a very complicated business. A lot of young architects are to preoccupied about the “design” but there are so many other things that encompass being a good architect. The hardest part is to get a good building built. Whether it is or isn’t something great, whatever it is, try to get something built. I remember when I was a student I would always say in my head “what would Mies Van Der Rohe do?” but I don’t know if I have an architect accompanying me anymore. I don’t feel this way anymore, I don’t really have so much of a mentor or an idol anymore, maybe because so many architects influence me. Sitting at the drafting table and staring at the yellow tracing paper. I wasn’t like a lot of other students during my undergraduate studies: I didn’t work in a studio. I actually worked by myself in my own room. I was obsessing too much on certain projects. I should have look more for other opportunities instead of focusing on a single project that may never be built.